The Crowne Plaza in house dining at Prime Steakhouse Niagara Falls offers the best panoramic view of both the American and Horseshoe Falls as well as the surrounding area. Other nearby dining includes themed restaurants including the Hard Rock Cafe and Rainforest Cafe. This hotel is located in the heart of the Tourist District and is conveniently located only a block from the Falls. The Niagara Falls Crowne Plaza Hotel, a historic grand classic hotel, located in Niagara Falls, Canada. The Grand Dame of Niagara Falls Hotels, The Crowne Plaza is steps from Niagara Falls, and features direct indoor connections to Niagara’s first casino, Casino Niagara, the Fallsview Indoor Waterpark and all dining and attractions located on Falls Avenue Resort. 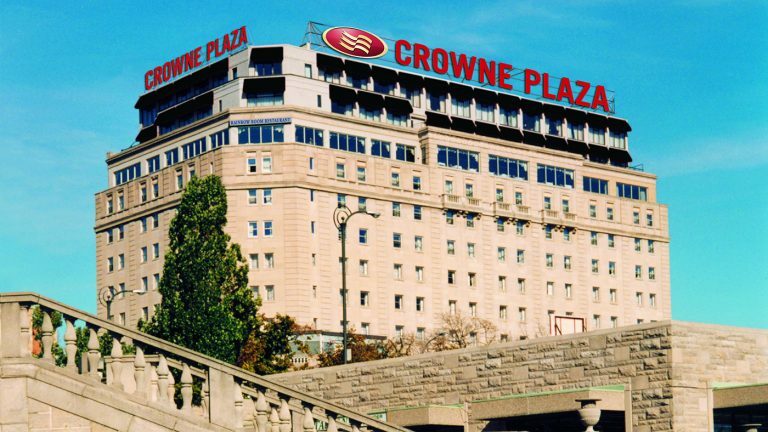 Built in the late 1920’s the Crowne Plaza is one of the most majestic and celebrated hotels in Ontario. The hotel was the first four star hotel on the Niagara Falls skyline, and today continues its legacy of service and elegance. The Crowne Plaza has been recently renovated to service guests with all the new-world amenities they come to expect from a 4-Star hotel. In house dining at the Crowne Plaza is located on the top floor of the hotel at Prime Steakhouse Niagara Fallse. To compliment this spectacular dining option is the stunning panoramic view of both the American and Horseshoe Falls. Also offered around the hotel are themed restaurants, such as the Hard Rock Cafe, and Rainforest Cafe. Each and every bed at this Niagara Falls hotel is a new Deep Sleeper Bed. The bed is comprised of a comfortable mattress, luxurious duvet and a collection of six fluffy pillows to ensure a great night’s rest, leaving you rested and relaxed. Wireless Internet access is available in all guestrooms at the Crowne Plaza Niagara Falls. The Crowne Plaza Hotel features an indoor swimming pool for guest use, including a whirlpool, and it features indoor connections to the Fallsview Indoor Waterpark. Located on the lobby level of the Crowne Plaza is the hotel’s shopping concourse. The shopping concourse has a variety of stores including: Piccadilly Gift Store, Canada’s only Hershey’s Chocolate World Gift Shop, The Always Refreshing Soda Shop, and Crock a Doodle. Also situated in the lobby, the Crowne Plaza houses its very own Starbucks Café. The Crowne Plaza boasts 12 elegant function rooms and meeting spaces. From the Grand Ballroom to small breakout rooms The Crowne will meet the needs of your next event. The Crowne Plaza features one of the most opulent ballrooms in Niagara Falls, and at 7578 square feet the room can accommodate up to 850 guests. Decorated in creams and gold, breathtaking chandeliers light up the Grand Ballroom. Situated on Falls Avenue Resort, the Crowne Plaza is connected to attractions, shopping, and themed restaurants through an indoor walkway. By hosting an event on Falls Avenue, meeting planners and co-coordinators have unparalleled access to first rate attractions, and themed restaurants for inclusion in planning and incentive based initiatives.